If there’s one thing I like about the French, it’s their soup. It’s not that I don’t enjoy indulging the baked buttery sweetness of their patisserie, because, honestly, who doesn’t enjoy a good pastry? 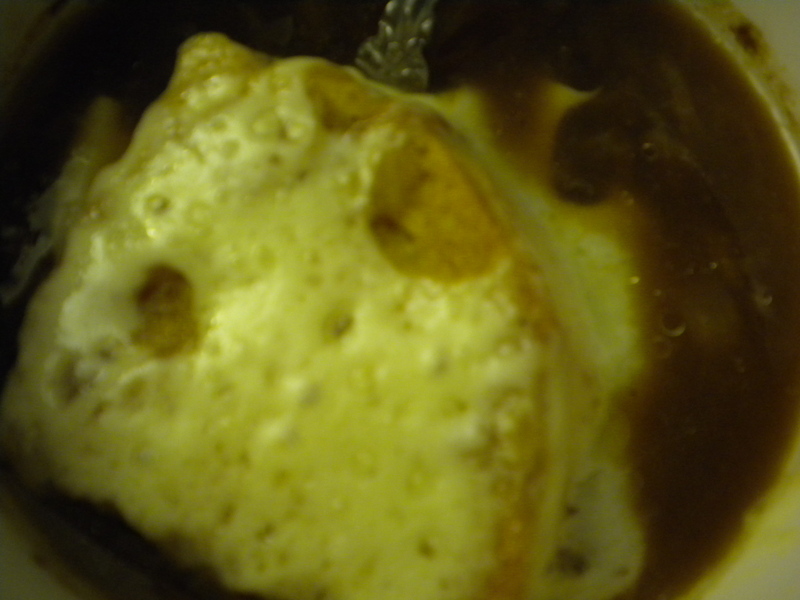 It’s just that true onion soup made with tender patience transports me to the France of my imagination: hoity chefs juxtaposed with rustic countryside and jazz. This is only my second effort with a Julia Child recipe; my first came late in the summer with a peach clafoutis (totally bangin’). 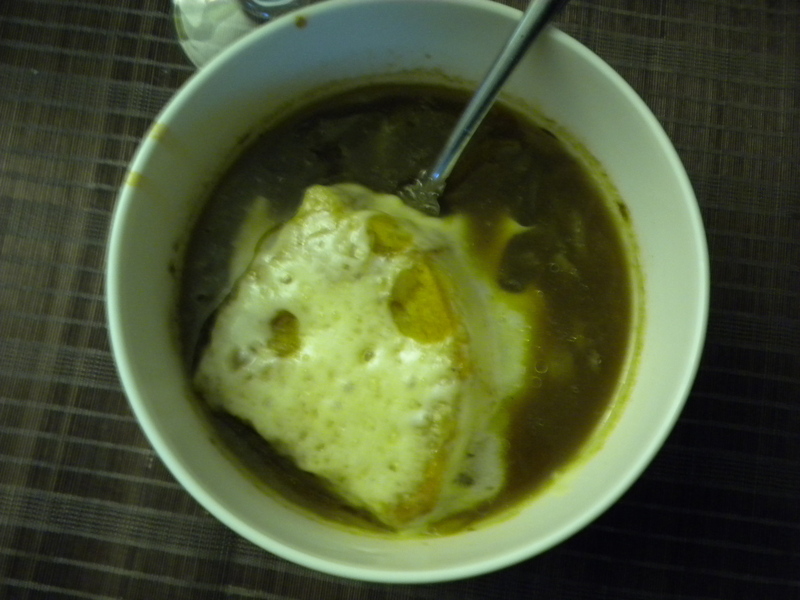 Hubs and I have been craving French Onion soup since September rolled in and although Campbell’s—(doctored up)—worked for a hot second, we knew nothing would beat from-scratch, homemade. 1–Take 3 T. butter and 1 T olive oil and add to it 5 cups thinly sliced yellow onion….and let it melt and sweat out on low heat for about 15 minutes, covered. 2–Turn up the heat to moderate and add 1 tsp. salt and 1/4 tsp. sugar, and stir the sucker frequently for 30 minutes or so….perhaps shorter, more likely longer…until they are a caramelly, succulent golden brown shade. 3–Add 3 T flour and stir until well-blended. 4–Now comes the soupy soupy part!!!! OFF HEAT, add 2 quarts—that’s 8 cups–of delicious beef broth and 1/4 cup dry white wine (we used a Sauvignon Blanc from New Zealand called Zeal) and that’s it. Season with salt and pepper (and whatever else you might add–a little garlic might be nice, or a touch of rosemary?). Adjust seasoning to taste. Let the sucker REST on simmer for about 40 minutes, stirring and checking on it occasionally. 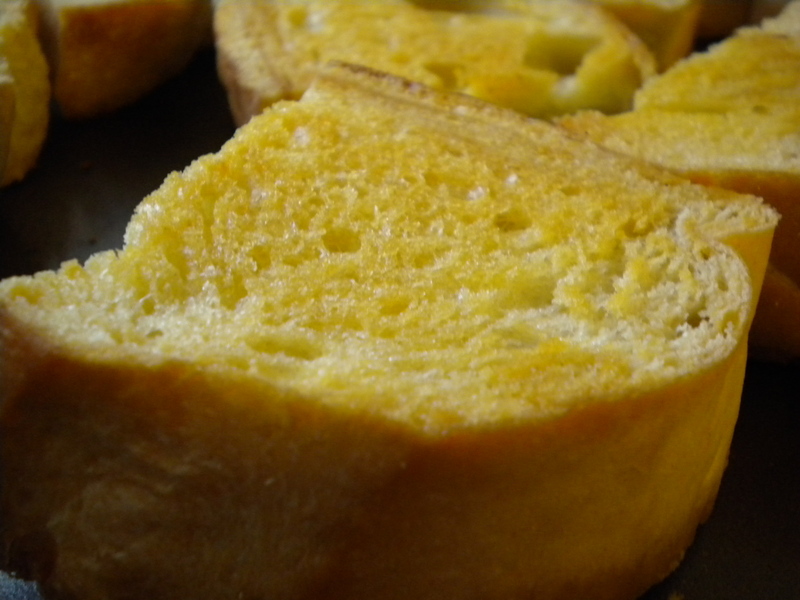 5–At the end of your cooking time, take a few slices of French/Italian/baguette-style bread and brush it with butter/olive oil/garlic and other things you might find taste good, and broil until just golden. 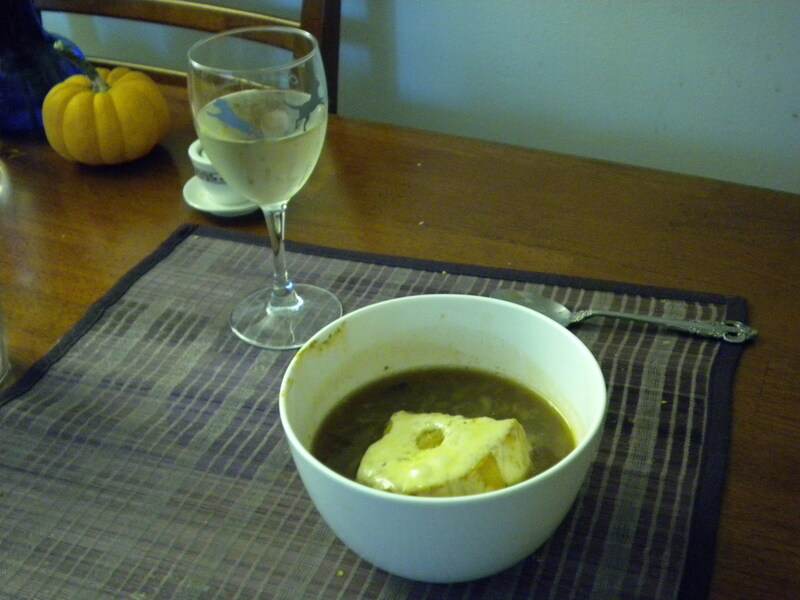 6–Soup’s up! Ladel out your French yummy creation into oven-proof bowls, float a bread slice on top, and on top of that place you a slice of Swiss Cheese!!!!! Stick it under the broiler until just melted. Let me know if you make it and how it turns out for ya! Previous Previous post: Apple Valley Harvest mmm mmm GOODNESS!